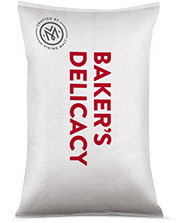 Delicacy Pale Malt is produced of 100 % pure malting barley and is enzymatically active. Viking Delicacy Pale Malt flavor is usually described as slightly nutty, cereal and sweet. Due to its enzyme activity, it can be used to adjust falling number and boost yeast activity in baking applications. Contains no colorings, preservatives or other food additives.